If there is one food staple in our house that we could not live without, I’d have to say it is the potato. I’m pretty sure it stems back to my Irish roots. I whipped up this Cheesy Potato Casserole, which I altered to give it a bit more cheesy goodness and crunch from the one I found over at Marvelous Recipes. I love those onions, great idea! Everything is always bettter topped with onions and cheese too of course! Oh my goodness – this looks so amazing, I could eat a whole plate of this casserole! Yum … that looks like comfort food at its best! This looks delicious… I came from Thursday’s Treasure. Pinning it. It’s definitely a family favorite Marly. Thanks for stopping by. These look delicious! Thanks for sharing! I am definitely going to try making! Thanks so much Chrissy. My 3 year old loved it! My daughter loved the cheese and I like you love the crunch. Thanks for pinning Erin. 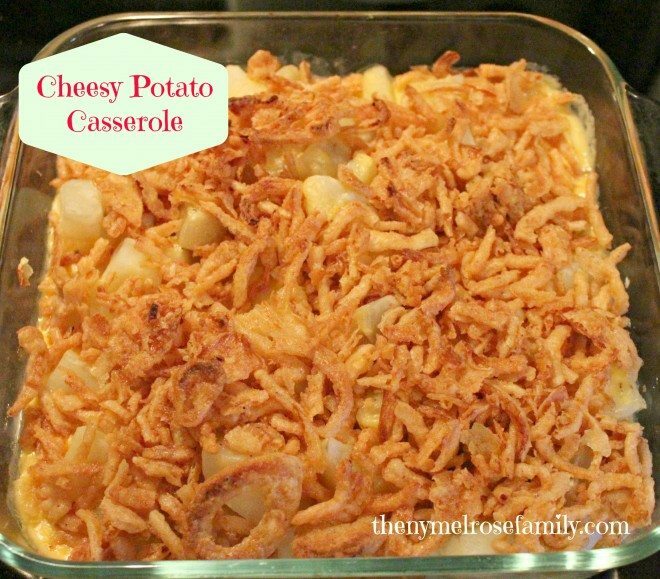 I love a cheesy potato casserole especially with a crunchy top. Thanks for sharing on Thursdays Treasures.